Everyone has worlds inside of them. 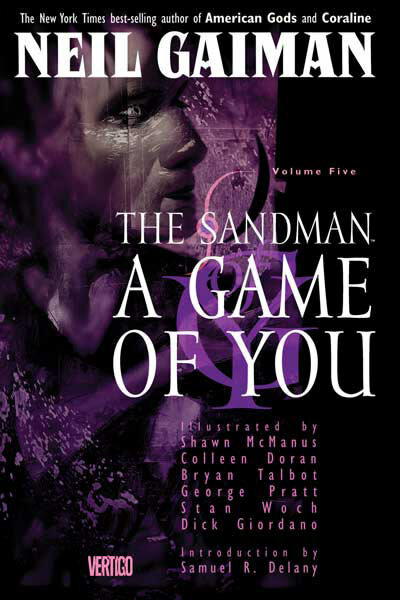 This theme isn’t new to the Sandman series, but it’s revisited more strongly here than elsewhere in the ongoing saga. A Game of You features Barbie, who we first met back in Volume 2. She’s left her husband, moved to New York, and now lives in an apartment building with a lesbian couple (Hazel and Foxglove, both connected back to characters we’ve met before as well), a transwoman named Wanda, a quiet woman named Thessaly (who turns out to be a centuries-old witch), and a strange man named George (who turns out to be no sort of human at all). And in her dreams, Barbie lives in a fantasy realm. We caught a glimpse of it back in Volume 2, but it’s more fully realised here: an expansive world populated by talking animals, Narnia-esque. Here, Barbie is a princess, called upon to defeat the evil Cuckoo and restore justice to her realm. The two worlds collide when a figure from the dream realm crosses over to the waking world — an enormous doglike creature called Martin Tenbones, who manages to pass a message and a strange gem on to Barbie before being gunned down by the NYPD. Bizarrely confronted by what she thought was only a dream, Barbie (not inexplicably) wonders if she’s cracking up. That night, the gem — the Porpentine — sends her into a coma-like sleep. Deep in her dreamworld, . George, revealed as a servant of the Cuckoo, releases nightmares in bird form upon the other inhabitants of the apartment building; when Thessaly catches one trying to get to her, she first kills it and then kills George. Gathering Hazel, Foxglove, and Wanda, she starts working old, bloody magic, using George’s remains to get answers about the Cuckoo and Barbie’s dream world, then drawing down the moon to walk its path into the magical realm. She takes Hazel and Foxglove with her, but leaves Wanda, chromosomally a man and thus unable to travel the moon’s path (and anyone looking for commentary on transgender issues will have loads to deal with there), behind to deal with a talking corpse, a comatose Barbie, and an impending hurricane caused by Thessaly’s meddling. Meanwhile, in the dreamscape, Barbie’s trekking across a frozen wasteland, through a dark forest, and other such fantastical . In the end, we learn that this dreamworld was an island, a skerry of dreaming, isolated unto itself, and that its original inhabitant was a woman named Alianora, proud and beautiful and with a scar cutting across her right cheek. From her brief conversation with Morpheus, we can intuit that they were lovers once (and from what we know of Morpheus, we can assume it ended poorly) — but to the best of my knowledge, her full story is never told, a mystery left past the end of the series. Barbie was just the latest in a series of women who came there to dream, populating the realm with their imaginations. We get Dreaming from a more human perspective here, rather than the viewpoint of Morpheus or other immortals. Morpheus only comes in at the very end of the story — Endless ex machina — and as a result, this story is rather more personal than a lot of the story. Its scope is (hurricane notwithstanding) less epic. When Barbie sleeps, she finds herself dropped into a world that is strange yet somehow familiar, which operates on its own set of rules — some of which she instinctively knows, and some of which she has to learn as she goes along. And everyone knows that feeling. Dream logic doesn’t resemble waking logic, but it does have its own patterns. So, there’s the outline. I don’t really care for this volume, to be honest — and I’m not sure why. Barbie’s the sort of figure I ought to empathise with tremendously, but something about it just falls flat for me. Maybe it’s just that I do prefer the epic scope. Maybe it’s that there are places where this volume seems too conscious of making a point, rather than just telling a story. Maybe it’s that — despite bringing back a character we’ve seen before and introducing one we’ll see again — it feels more disjointed from the rest of the series than most of the volumes do. It still has considerable technical merit, and there are parts of it I enjoy, but ultimately this isn’t one that sticks with me.